Clearly, as landlord and partner, Jean-Georges Vongerichten is betting our town’s noodleheads will be moved by the esoteric noodling of Japan’s entrepreneurial Matushita brothers, installed now at Matsugen, where “66” fizzled out. 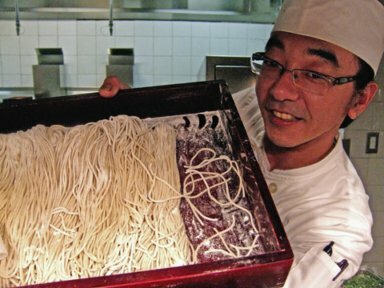 For me and the duo of soba-sensei joining us tonight, the house’s couturier buckwheat extrusions in three different textures are an exciting revelation. Two of the brothers are here to shepherd this seedling along with their longtime chef Yoshitaka Nakamura and crates of machinery that wrestle the buckwheat kernels into proper submission. True, the spot is still dully illuminated and spare, except for the new bar-lounge, a lively communal table, and that fabulous fish tank that gives you a watery peek into the kitchen. The minimalism bothers me less, but the somber lighting still needs a fix. 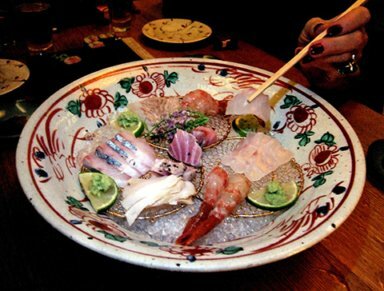 Alas, exquisitely mounted sashimi (the house’s $120 gift) is too cold set on ice in its stunning bowl and, except for luminous baby shrimp, I’m not getting that longed-for mouth feel that brings on a shiver. Tight little sushi rolls are sadly mushy. But so much else is good – the tickle of peppery heat on edamame in a pretty basket, luscious homemade tofu, the lively seaweed salad, four shimmering little shrimp cakes perched on shitake and the Bakuden bowl: salmon roe, baby scallops, scallion, poached egg and nori crowned with uni, our quartet’s special passion. Then comes the soba seduction. We’re trying it hot and cold, coarse and silken. 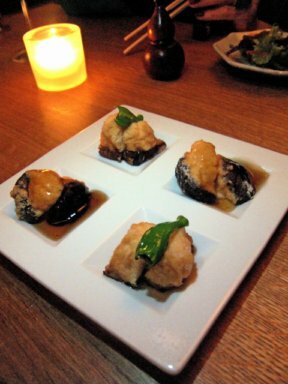 Delicate “rin,” served with a rich “gome dare” sesame sauce. “Inaka,” coarse from husk bits, with duck and scallion in a savory broth. A marvelous soufflelike egg coverlet tops my guy’s textured noodles. 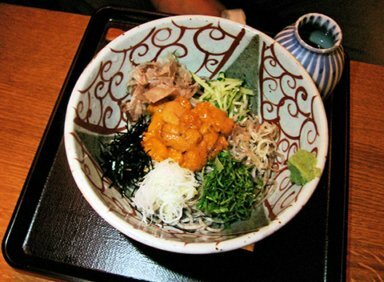 And our pal offers tastes of his Matsugen special, cold soba with sea urchin and a wreath of condiments on smooth “seiro,” medium husk soba. Green tea ice cream brulée looks ghastly but is oddly pleasant. Our very engaging and knowledgeable waiter recommends strawberry water with almond tofu and crystal tomato gelatin in coconut broth. Be warned: Drinking beer, ignoring cocktails and sake, and penny-pinching the menu to avoid the priciest items, we still manage to drop $140 a couple. In Japan, that would scarcely elicit a murmur. But we eat out every night and we’re saving for a splurge in Paris at l’Ami Louis and perhaps one day that loft that might become affordable.